Just a little post to say that I'm back from my month long vacation, and so will get back to blogging shortly! 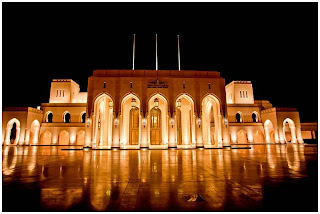 I'm sure those of you that are regular readers of Oman based blogs will have already heard about the on-going drama caused by His Eminence the Grand Mufti of Oman, Sheikh Ahmed bin Hamad Al Khalili's comments regarding the new Opera House in Qurum. 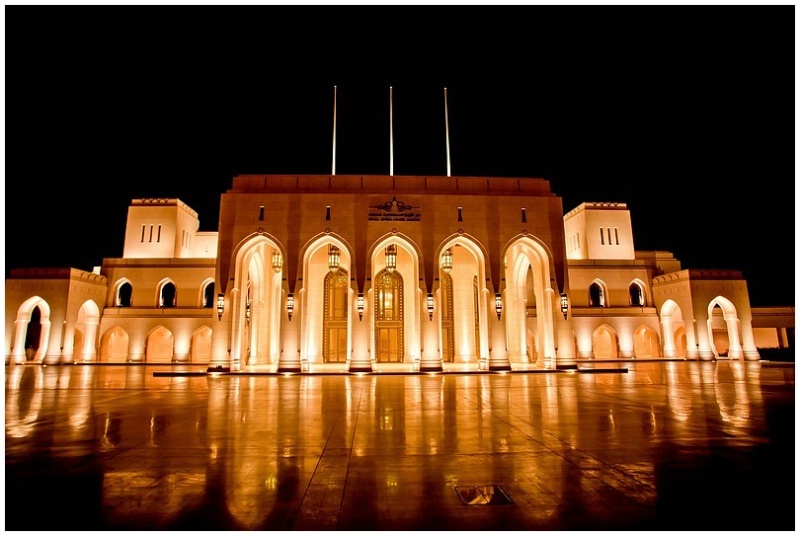 Question: My Mother, may God grant her health and long life, wants to visit the newly opened Royal Opera House to admire the architecture and beautiful designs. Is this acceptable, given the fact that such venues host musical events known to the world as 'opera'. This is the main purpose of the venue. Mufti: since the dedicated purpose of this venue is music and dance, then visiting it is not acceptable. As for the architecture and designs, they're not exclusive to this location only and can be found at other locations, and Allah knows best. Now, Dhofari Gucci, Lino and Balqis have all blogged about this topic so I wont spend too much time discussing it, but I will say that it's worth reading all three of these bloggers comments about this. As a non-Muslim I'm not really too involved in these discussions but it does appear evident that music is not allowed in Islam, which I find rather amusing seeing as most calls to prayer I hear the person is usually singing, but lets not get into that. I think the Opera House is a timeless classic that will outlast every single one of you that is reading this. It's beautiful and is something I think people should be proud of. I think that saying that people can not go to the ROH because it "hosts musical events" is totally ridiculous and narrow minded. One could extend this concept further and say people should not have mobile phones because they are capable of playing music, or watch TV because there might be some music played on it, or drive cars because they have stereo's in them. I'm being pedantic but hopefully you get what I'm saying, and to be fair, Dhofari Gucci said the same thing, to quote her, "if you want to instill sound Islamic beliefs in the new (and coming) generations of Omanis, religious leaders must make their teachings relevant". And before the haters weigh in: No I'm not anti-Islam, I'm just bemused amazed by this particular situation. Debates about religion seldom prove fruitful when discussed online (as compared to being face-to-face). Hence, I'll only explain the point about the call to prayer (Adhaan). The 'singing' (we refer to it as reciting) doesn't end there. If you were to hear the imam (prayer leader) reciting the verses from the holy book (qur'an) during the actually prayers (evening, night and early morning) you will find it even more melodious than the call to prayer at times. This is because humans naturally get drawn to melody. So, as muslims, we realize there is no harm in using ur voice melodiously. But only for the praise of the Almighty Allah and Without any musical instruments (except for a traditional drum called 'Duff' in Arabic). Please understand that I do not intend to start a debate but just wanted to elaborate a point. But to me music is totally Haraam (Not permitted. At all). Omer- to not permit music. At all. Is preposterous and archaic. Balqis- How do you use a phone or TV accordingly? I have never seen people so infatuated with nonsense TV soaps (with music and dancing) as people of this part of the world! Do you watch TV with a tin hat on? Music and dance aren't material things..... anyway, lucky you in Italy! Ciao! Lover Lover Lover: Of all the OPNOs, we all hold differing Islamic beliefs, but I for one, generally, though not successfully 100% of the time, try to avoid music. So watching TV? I don't watch music channels and simply turn the volume down on things where the music isn't relative to the story. And I don't watch crap soap operas either lol, English or Arabic. Doesn't mean there is nothing at all on for me to see though. I think I'd regard the opera house the same. I won't go to a musical show (so another OPNO girl will blog about that:)) but I would think the architecture is fine in itself to admire or maybe some play depending on the content. Who knows? Context is everything. But the Grand Mufti's fatwa is based on the context that the Opera House will not provide anything other than dancing and music which more accurate Islamic narrations advise on avoiding. I can understand why alcohol, smoking, adultery etc are bad, but music generally makes people happy. Those who don't agree must be a pretty sad bunch. If music is not allowed in Islam, then ALL Omanis I met (indeed all muslims I know) break the law of Islam. Most love music of one sort or another. Long may that continue. Are there any muslims anywhere in the world who actually are able to live the way they like to interpret their book? Sounds like they are setting each other up for failure and that is why so many of them cheat, lie and steal. It's all hot air if you ask me! Plus, it is the beauty and genius of classical music that inspires godly behaviour.